$37.67 $49.99	Get Your Stuff! Bluetooth: Wirelessly stream audio anywhere up to 30 Feet. Connects with all Bluetooth tablets and smartphones. Has Aux line-in jack to play audio form devices equipped with a 3.5mm headphone jack. Powerful Sound: Powerful sound performance allows you to listen to all your favorite tunes. Includes the song "Star Wars (main theme)". Call Feature: Get a phone call while listening to your music? Not a problem, this bluetooth speaker has an answer and end call feature via speakerphone. Rechargeable Battery: Rechargeable lithium-ion battery with charging cable (included) allows you to listen to your favorite tunes as long as you like. Perfect Gift: This will make any Star Wars fan's day. Whether listening to the Star Wars theme song or your own music, you can do so in style. 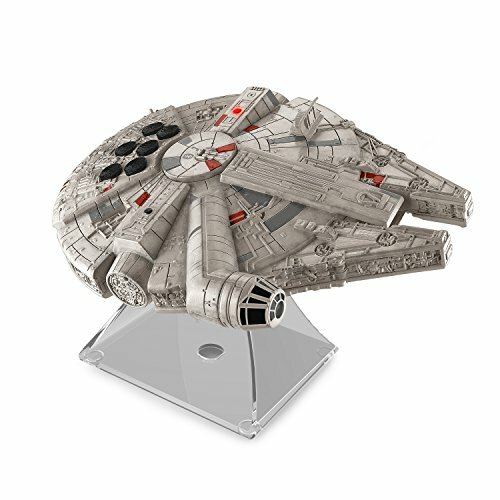 The Millennium Falcon Bluetooth Speaker (via Amazon) is not only an awesome wireless Bluetooth speaker with a 30′ (10m) range. It’s also a pretty good model of the Falcon and includes the updated, square, sensor dish from Episode VIII. The engines light up when in use and it even has the Star Wars Theme as a built in-song you can play anytime by pressing the top button (where the quad turret is located). Speaker quality is good and the battery will last a long time between charges. It even has a Bluetooth microphone so you can make hands-free speakerphone calls. So, whether you like to listen to the Imperial March or earth-based music, if you’re a Star Wars fan (and who isn’t?) 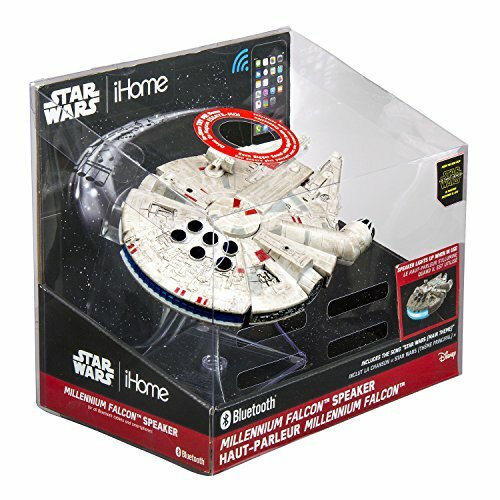 you’ll love this Millennium Falcon Bluetooth Speaker. However, if you happen to be more of an empire fan, take a look at the Star Wars Stormtrooper Bluetooth Speaker. It might be just the droi… err… speaker you’re looking for. Dimensions: 10.39 x 7.17 x 9.45 in. 30′ range (Far out of accurate Storm trooper blaster range). Answer and end calls via speakerphone. Engines light up when in use.